It is hard to find the entrance of Kaminato Port at Hachijo-jima Island. The port entrance is behind a breakwater which has a yellow small light at the right end. The breakwater also has a big white lighthouse in the left of the yellow light. While the breakwater is located in front of the port, it seems to be blended into the background and looks like a quay. 1) First, you find out the breakwater which has a small yellow light at the right end and a big white lighthouse in the middle. 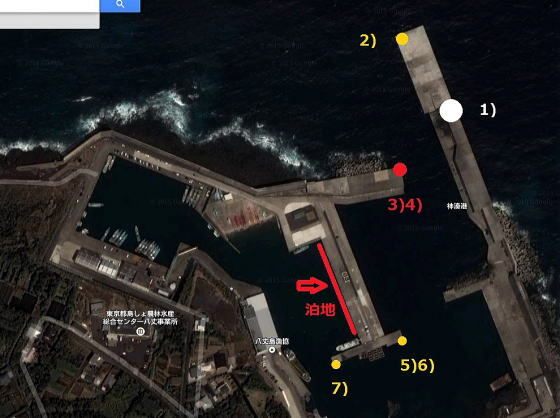 2) Second, pass by the right end (at which the small yellow light is) of the breakwater on your left and turn into the port. 3) At the backside of the small yellow light, you will see a breakwater running from the right on the right ahead of you. The breakwater has a red lighthouse at the left end. 4) Move further inside along the breakwater which has the big white lighthouse, and pass the red lighthouse to your right, then you will be inside of the port. 5) You will see another small yellow light in the further right inside. 6) Turn right at the small yellow light. 7) Once you turn right, you will see another small yellow light. Your sailing boat berth (the red line in the picture) is located behind it. 8) You may see a building of fishermen’s cooperative, “Gyo-kyo”, and a quay for landing on your left. 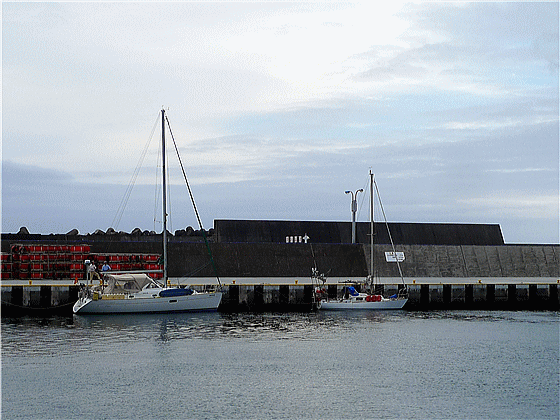 9) Your sailing boat berth is a quay on your right, the opposite side of the building. Water can be taken at a water tap outside of the toilet. A key is required to open. There is a Japanese style toilet one minute away from the quay. 1) Kashitatemukaizato Onsen “Fureai no Yu”: This has a taste and is the best of Onsens. Local people go there. 2) Sueyoshi Onsen “Miharashi no Yu”: This has a great view and an open air spa. 3) Nakanogo Onsen “Yasuragi no Yu”: This is a clean Onsen. In addition, there are Uramigataki Onsen in which you put on a swimsuite and Za BOON. Fuel is at a gas station 10 minutes walk away. No coin laundry. I used a laundry machine at “Asagiku”, an inn for fishing tourists. I stayed there for just one night though, I used the machine without staying. There is a big supermarket “Hachijo Store” 20 minutes walk away which has a good selection of goods. “Takara Tei” is a good restaurant near the port. Delicious, but expensive a little bit. There are many restaurants and drinking places around Goshin intersection. “Rhozanbaku” is a good drinking place. This page also has a good guide of Onsens above with pictures.